With our labs around the globe and our experienced workforce we will be able to support your programs in a reliable and timely manner. We provide an integrated approach between our field services and analytical phase including control of the shipments between the study sites and sample preparation. Our studies carried out according to international standards (OECD, SANCO, EPA) and in compliance with GLP. 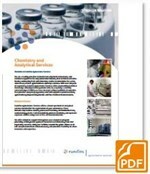 You can download our Chemistry services PDF as a general introduction.